Newbridge Greyhound Stadium is celebrating 70 years this coming Friday, May 4, and it’s all for a good cause. Face painting and friendly retired greyhounds will greet families that make their way to the Cornelscourt stadium in Newbridge. All admission sales on the celebratory night will be going to a local charity that will be announced on the night. 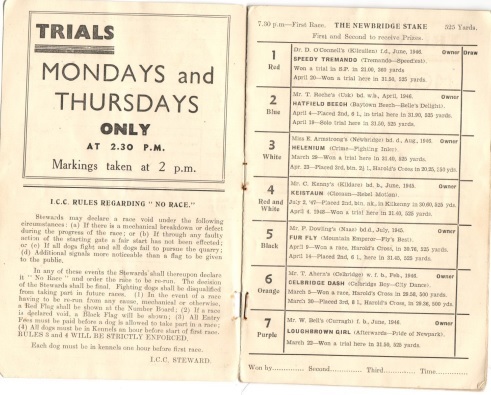 Newbridge’s first historic race meeting was held on Friday, April 30, 1948, at St. Conleth’s GAA Park. More than 1,200 customers are said to have braved the unfavourable weather conditions on the opening night and paid the princely sum of three shillings. The admission then went to the St. Vincent de Paul Society. Kildare is synonymous with horse and greyhound racing with many national champions bred and trained locally. Jack Moylan, a legendary jockey claimed the first Greyhound Derby in 1932 with Guideless Joe. Two years later, another top dog, Frisco Hobo, won the Derby for Athy’s Tim Fennin. These winners created significant interest in greyhound racing that has now existed in Ireland for 90 years. One name steeped in this 70 year history is the Cox family, in particular Patrick J. Cox who ran Cox’s bar on Main St, Newbridge. 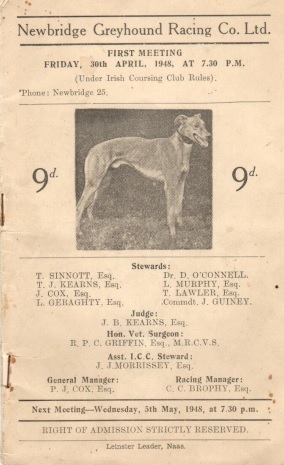 Paddy Cox became the first chairman of the Newbridge Greyhound Racing Company and was joined by a Thomas Lawler from Halverstown, Thomas J. Kearns and Thomas Hughes, both Newbridge, among other early shareholders at the time. In 1972, all race meetings were moved to Cornelscourt on the Milltown Road where it has remained since. Having cost £50,000 to develop at the time, it was said to be the most modern track in the country. The track directors included P.J. Cox, Owen Lawler, Sam Weller, J.B. Kearns and Michael McStay. Many of Ireland’s young rising greyhound stars have started their careers at the Newbridge venue. The Cox Cup, named after the local stalwart of the sport, is due to be reinstated in 2018 and will attract much interest from the local greyhound community.